Priscilla Upton Byrns passed away peacefully in Minneapolis on Jan. 3, 2018, at age 88, surrounded by her family. Born on Nov. 28, 1929, she was the daughter of Frederick S. and Margaret B. Upton of St. Joseph. Her father was a founder of what is now the Whirlpool Corp. After attending local schools, she graduated from Emma Willard School in Troy, N.Y. She later received a bachelor’s degree from Wheelock College in Boston. In 1953, she married Chester J. Byrns of New York City. Chet was a successful attorney and later a long-serving circuit court judge in Berrien County. They were married for 48 years when he died in 2001. Prill was blessed to have an exceptionally loving and close-knit family, which formed her character. Her entire life was spent in the Twin Cities, where she was active in a multitude of volunteer activities. 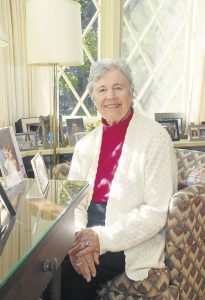 Highlights of her service include the YWCA, St. Paul’s Episcopal Church, Southwest Michigan Symphony, Monday Musical Club, P.E.O., Daughters of the American Revolution, Girl Scouts, Heritage Center, Indian Hills Garden Club, Frederick S. Upton Foundation, First Congregational Church choir, Beach Bums and the Lincoln Senior Center, where she was an ace bridge player and until recently its president. She embodied and epitomized the tradition of over a century of community service by the Upton family. She was both a pillar of her community and its modest servant. A true leader with the softest touch possible, she was able to get great things accomplished through the force of her substantial charm and authenticity. Her extensive volunteer efforts and work on behalf of the community were recognized by numerous leadership awards. Her steadfast dedication to the Heritage Center resulted in its new building being named the Priscilla U. Byrns Heritage Center in 1998. An accomplished sportswoman, she was skilled in tennis, swimming and bowling, and was an avid follower of many sports teams, most especially the Chicago Cubs, Michigan Wolverines and Oklahoma City Thunder. Music was another passion, and she enjoyed decades as an enthusiastic singer, bell ringer, flutist and a lover of classical music. Prill delighted in the natural world, spending many hours in her extensive gardens, snorkeling amidst tropical fish, and enjoying her many beloved dogs and cats. She did her best to avoid stepping on an ant. But above all, her greatest love and devotion were to her family, which was the beneficiary of her nurturing spirit. She was the perfect complement to her intellectual and hard-driving husband, Chester. She taught her children the importance of love of family, concern for others, giving back to one’s community and being sure to enjoy the precious gift of life. Prill was a strikingly beautiful woman her whole life – always natural – but nothing could eclipse her radiant, larger than life smile. Utterly without pretense, Prill’s warmth enabled her to win the affection of all she met. Optimism was a natural and animating part of her spirit. Her like will not be seen again, and she will be deeply missed by her family and legions of friends. She was predeceased by her husbands, Chester J. Byrns and Charlie K. Field; special friends, Bert Lindenfeld and Marvin Lasota; son-in-law, Aubrey K. McClendon; brother, David S. Upton; and sister, Sylvia Upton Wood. She is survived by her four children: Stephen (Thomas Lollar), Carrie (Neil) Vill, Kathleen McClendon and Melinda (Eamonn) O’Brien. She is also survived by seven grandchildren: Jack McClendon, Will McClendon, Callie McClendon Katt, Julia Vill Mehra, Maddie Vill, Conor O’Brien and Meg O’Brien; one great-grandchild, Andrew Kerr Katt; and her brother, Stephen E. Upton. A public gathering will be 5-8 p.m. Friday, Jan. 12, at the Priscilla U. Byrns Heritage Center, 601 Main St., St. Joseph. The funeral will be at 2 p.m. Saturday, Jan. 13 at the First Congregational Church, 2001 Niles Ave., St. Joseph. A private burial will follow the service. Those wishing to leave a condolence online may do so at www.starks-menchinger.com. In lieu of flowers, memorial donations may be made to the Heritage Museum and Cultural Center, 601 Main St., St. Joseph, MI 49085, for online donations, www.theheritagemcc.org. Lansing – Age 85, passed away November 13, 2017. She was born November 7, 1932, in Flint, MI, to Michael Sylvester and Frances Helen Klein. Stephanie was a lifelong supporter of the vocal performing arts. She sang soprano throughout her life as a member of many choruses and choirs including her high school glee club, Central United Methodist Church choir, and the Lansing Matinee Musicale. 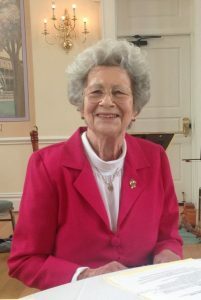 A tireless volunteer, she served in many capacities with both the Michigan (past president) and National Federation of Music Clubs, as well as Junior Festival chairperson for many years. She will be deeply missed. She is survived by her loving husband of 63 years, Bob Westerfield; children, Stephen D. (Kerry) Westerfield and Julie M. (Rodrigo Sanchez) Westerfield; grandchildren, P.J. (Luke) Gilmore, Nathan Westerfield, Samuel Kirkey, Erin (Marshall) Cornett, and Baylie Sanchez; 3 great-grandchildren; special cousins, Eddie K. Poole and Luana (Kenneth) Lemasters; and many nieces, nephews, cousins and other extended family members. The funeral service will be held at 11:00 a.m. on Friday, November 17, 2017, at Central United Methodist Church, 215 N. Capitol Ave., Lansing. Her family will receive friends from 2-4 and 6-8 p.m. on Thursday at the Estes-Leadley Greater Lansing Chapel and beginning at 10:00 a.m. on Friday at the church. Interment will take place at 11:00 a.m. on Saturday in Byron Cemetery, Byron, MI. Memorial contributions may be made to Lansing Matinee Musicale, Inc. or the Michigan Federation of Music Clubs. It is with great sadness that we announce the passing of our friend, Tenney Miller. Tenney is a former Michigan Federation of Music Clubs President and Monday Musical Club President and served on the national, state, and local levels. However, her love and devotion was for the Junior Club, where she championed for education and scholarship. She loved attending Student and Junior Club performances and never failed to praise students. Her enthusiasm was infectious! Her dedication to the annual National Music Week celebration was honored annually by the National Federation of Music Clubs. Her love for music was only shadowed by her faith and love for her family. She will be greatly missed.